Google Forms can be used for numerous tasks on our campus including: collecting student feedback on new assignments or a department activity, collecting faculty feedback regarding policy changes, program entrance and exit surveys, course and program assessments, application forms, etc. All of the data is easy to download into a spreadsheet. 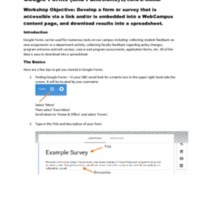 This document is the "How-To Guide" distributed to Google Forms Workshop participants presented by Carrie Meisner as a Spring 2016 Faculty In-Service. Carrie Meisner, “Google Forms (and Functions),” Digital Humanities of the Great Basin at Great Basin College, accessed April 25, 2019, https://humanities.gbcnv.edu/omeka/items/show/167.